Donald J. 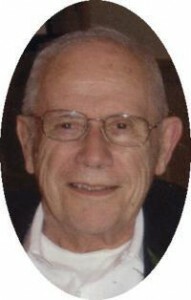 “Perch” Rilling, 87, of N. Montgomery Street, Port Washington died December 31, 2010 at Aurora Medical Center in Grafton. He was born December 30, 1923 in Grafton, Wisconsin to Henry M. and Clara Staab Rilling. He attended St. Joseph’s Catholic School and received his GED while serving in the military. He served in the Navy as a Store Keeper Second Class during World War Two from 1941 to 1948. He married Marilyn E. Gessner of Port Washington on May 20, 1950 at St. Mary’s Church, Port Washington. Perch was a crane operator at the Wisconsin Electric Power Plant, unloading the coal boats from the Port Washington harbor until he retired in 1985. He was a member of the International Association of Operating Engineers Local 317, Van Ells-Schanen American Legion Post 82, Port Washington, Past Ozaukee County Commander of the American Legion, Ozaukee County Memorial Post 5373 VFW and St. Mary’s Parish, Port Washington, serving as an usher for over 50 years. He had also been a clown in the first Fish Day parades, and active with his family in the former Windjammers Drum and Bugle Corps. In his youth he enjoyed playing baseball and later was an umpire for many years. He had a great sense of humor and enjoyed people, singing in barbershop quartets, playing cards, solving crossword puzzles and loved his family. He is survived by his wife Marilyn of Port Washington, children Karen (Doug) Conradt of Port Washington, Jim Rilling of Port Washington, Diane (Don Schultz) Rilling of Oregon, WI and Suzanne (Christian) Koch of Wilmington, NC. Further survived by 10 grandchildren, 13 great grandchildren, other relatives and friends. Preceded by his son Thomas “TJ” and brothers Earl “Curly” and Henry Jr. “Tink” Rilling. Rev. Patrick Wendt will celebrate Mass of Christian Burial 10:30 am Tuesday, January 4, 2011 at St. Mary’s Church, Port Washington. Interment parish cemetery. Visitation 4-7 pm Monday January 3, 2011 at the funeral home with a VFW Vigil at 6 pm and after 9:30 am Tuesday, January 4 at St. Mary’s Church, 430 N Johnson Street, Port Washington.